More than 87 percent of Australian workplaces are small businesses employing fewer than 20 people. These small business owners know their markets, know their customers, and know how to make their small business run. What they may not know is the "people stuff." HR for Small Business For Dummies, Australian Edition, explains the simple ins and outs of human resources for businesses too small to have a dedicated HR staff. When it comes to the daunting task of complying with employment regulations, small businesses are treated no differently than big businesses, so it's imperative for small business owners to understand the regulatory framework that governs every phase of the employee/employer relationship in Australia. When it comes to hiring and managing employees in your small business, failing to understand human resources and employment regulations can cost you a bundle. 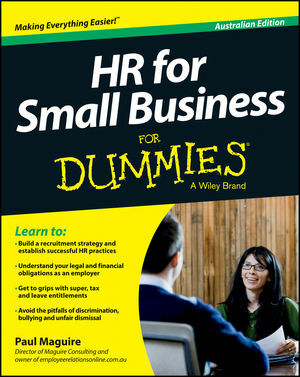 HR for Small Business For Dummies makes human resources easyso you can focus on business.